Pre-heat your oven to 425 degrees F. Place the chestnuts on a lined baking sheet. 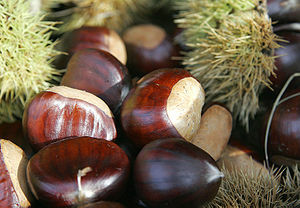 Cut an X into each chestnut or poke each chestnut with a fork, to allow steam to escape from them while they roast. Roast for 15-20 minutes, until tender. Allow to cool completely before peeling. After peeling, chop roughly and place in a large bowl. Reduce the heat in the oven to 350 degrees F.
In a large skillet, heat a tablespoon of olive oil over medium-high heat. Add the sausage, casings removed, and break apart with a wooden spoon. Cook until there is no more pink in the sausage, about 8 minutes, then remove with a slotted spoon to a separate surface to cool. Add a tablespoon of butter to the skillet, melt over medium-high heat, and add the diced onion. Saute until translucent, about 8 minutes or so. Add in the minced garlic and saute for another minute or two, until fragrant, then remove from heat. In the bowl with the chestnuts, add the diced apple, dried cranberries rosemary, minced tarragon, cooled sausage, and cooled onion and garlic mixture. Toss to combine. Add in the 6 cups of stuffing cubes, then 2 cups of chicken broth, Worcestershire sauce, salt, and pepper. Stir to combine, then add in more stuffing and/or chicken broth, depending on the consistency of stuffing that you prefer.